Wow--this is wonderful! I see several other posts also. You've been busy! This really good Debra, so much detail. Is it for the Virtual paintout by any chance? I almost missed this, not realizing that you had more than one post up! Spectacular! Love all the details! Cathy, not for Virtual paintout, I must have a look at that sometime. 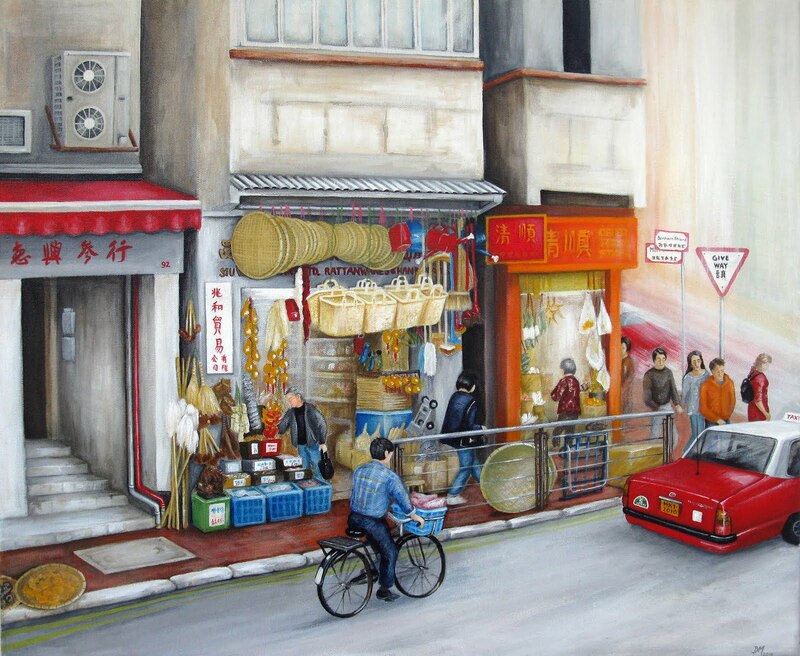 This is the painting for a Japanese family who have gone back to Japan and wanted something to remind them of Hong Kong. The rattan shop is real and done from several photos but the shop next door is in reality a dentist. The picture itself grew, I added various people,the taxi(which is so H.K.) and used my artistic license to change the shop next door and brighten up the colours. Sadly, shops like the rattan shop and dried food shops are becoming rarer in Hong Kong as we seem to be taken over by designer shops and big shopping malls. I also thought you would be a natural for The Virtual Paintout when I saw your work, and I think Cathy asked you if it was for VPO because "Hong Kong" is this month's virtual plein air location and everyone is wandering the streets of Hong Kong seeing sights like this wonderful painting of yours. Check it out. Your impressive work inspires. You finished this painting! Cool...It looks great and I think the Japanese family will like it lots! I discovered your blog through Leslie Purcell and see that she also bestowed an award upon you. Your art reminds me very much of what I learned in grade school in Europe. THank you for taking me down memory lane. It will be a pleasure to add your site to my blog roll and have it also listed on The DIRECTORY.